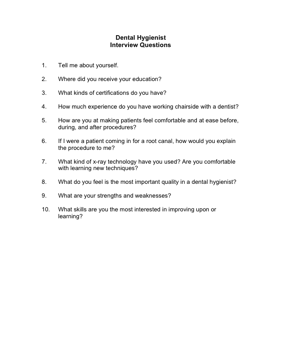 Choose your next Dental Hygienist with the aid of these helpful interview questions. 2. Where did you receive your education? 3. What kinds of certifications do you have? 4. How much experience do you have working chairside with a dentist? 5. How are you at making patients feel comfortable and at ease before, during, and after procedures? 6. If I were a patient coming in for a root canal, how would you explain the procedure to me? 7. What kind of x-ray technology have you used? Are you comfortable with learning new techniques? 8. What do you feel is the most important quality in a dental hygienist?